Recruiting and hiring great employees is a huge part of making your business successful. Your business is your employees. They do the day to day tasks that make your business work. If you hire great employees, your business is much more likely to thrive. Conversely, if you hire bad employees, your business is almost certain to fail. But all too often, companies struggle to hire effectively. They hire bad employees, time after time and repeatedly miss out on hiring great employees. 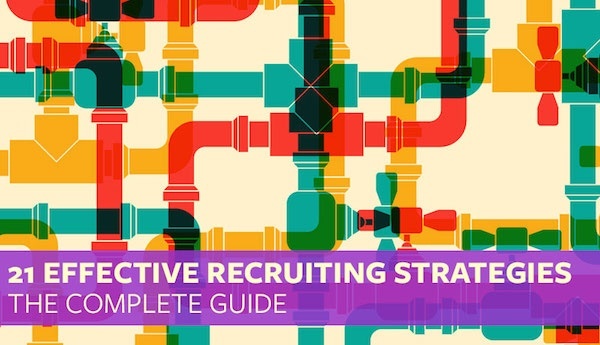 So we wanted to help you out by putting together this complete guide to recruiting strategies that will allow you to hire great employees to run your business. Do You Actually Need a New Employee? Before you even think about hiring, you should always ask if you actually need to hire someone. The best way to do this is with a simple cost-benefit analysis. 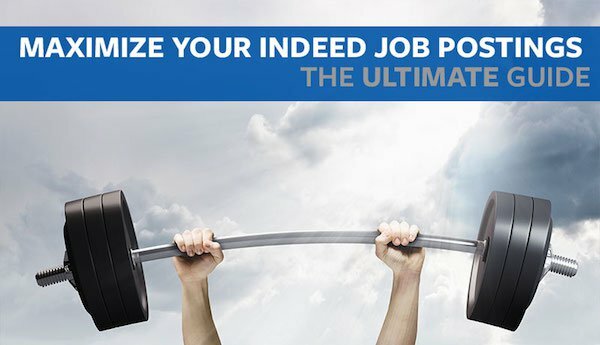 This will help you weigh the benefits of hiring a new employee against the costs. This will also prevent you from mindlessly hiring employees without first considering if you actually need that employee or if you can get by without them. As a result, you’ll find that sometimes employees are unnecessary, can be replaced by software or that even though they create benefits for the company, those benefits don’t outweigh the costs. 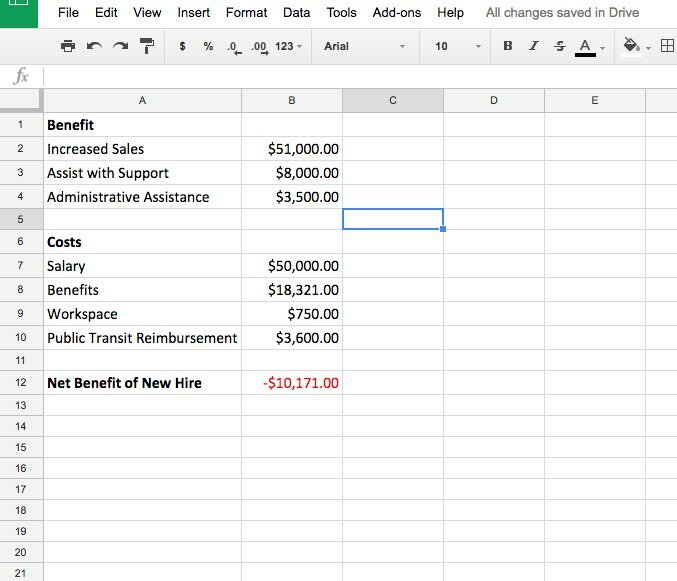 The easiest way to get started on your cost/benefit analysis is to fire up Microsoft Excel or Google Drive. Then simply create one section labeled benefits and one labeled costs. Try to put down exact dollar values for each benefit or cost, eventually arriving at the net benefit or cost of hiring an employee. See the chart below as an example. Sales: Will a new employee increase your sales? Focus: Will a new employee allow other employees to become more productive? Expansion: Would a new hire allow your company to handle more customers or growth? Development: Would a new hire allow your company to develop new products or services that would ultimately lead to more revenue? Salary: How much would you have to pay the employee? Benefits: What will benefits for the new employee be and how much will they cost? Don’t forget small benefits like free lunches, etc. Taxes: What taxes will you have to pay to hire and employ another employee? Don’t forget about worker’s compensation, social security, unemployment and medicare. Training: Training an employee takes a lot of time and resources. How much do those cost? Tools: Does the new hire need a laptop, desk, etc.? What will this cost your company? Onboarding: How long will it take for the employee to become productivity and how much salary will you pay before you get anything in return? Recruiting: You’ll have to spend a lot of money finding and hiring a candidate. This includes job board or recruiter fees, time spent interviewing employees, flights, food, and anything else you spend to find an applicant. Management: Will a new employee consume more of a manager’s time? What does this cost? Although the costs and benefits are obviously estimates, it should give you a pretty clear idea of how worthwhile it is to make the new hire. Once you’ve finished putting together the cost benefit analysis, take a deeper look at the benefits. See if there is a way you can get the benefits of hiring someone without actually hiring them. For example, can you use an online website builder instead of hiring an expensive web developer? If it still makes sense to hire the employee, go ahead and do so since you really do need them. In addition, you’ll have a clear conscience, knowing you’re making an informed decision. Hiring full-time employees comes with some serious costs. Not only do you have to pay them a salary but they usually need office space, lead to more taxes, have various benefits, take time to train, and more. However, many of these costs can be avoided by hiring a freelancer. Freelancers are often affordable, have an area of specialty they don’t need to be trained in and only cost money when you use them. Furthermore, the range of tasks a freelancer can do are extraordinary and range from computer programming to writing to customer support and more. Employers often forget that when they’re posting a job ad, they’re advertising the position and are trying to convince an employee to apply. 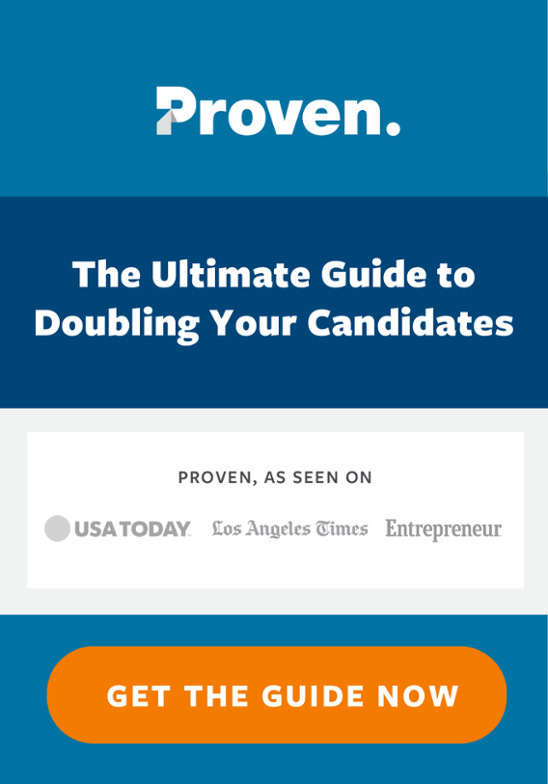 As a result, they create ads that simply announce they have an opening but don’t inspire candidates to apply. This leads to a tremendous waste of time and money. What’s the solution you ask? Write your job ads like you’re marketing the position. Start by highlighting the benefits of working for your company versus one of your competitors. Do you have a great culture? Do you do team lunches? Is there opportunity for advancement? Is your office comfortable? Do employees not have to work nights or weekends? Do you offer lots of vacation? Highlighting these key benefits and really convincing people to apply will lead to a lot more applicants. Also, like a marketing ad, you’ll want to have a call-to-action. In this case, your call to action should be a “How to Apply” section that encourages the candidate to take the step and submit an application! When you’re following up with applicants, it’s important to be quick about it. You should try to reach out to a good applicant as quickly as possible and set up an interview in the next few days. The last thing you want is to spend your time and money recruiting, find a good applicant and then lose them to another company. Your current employees are probably great fits for your company (otherwise you would have let them go already). So what if you had a network of people similar to your current employees, some of whom almost certainly will be looking for a job? Well, you do. Or at least, your employees do. The key is to tap into this network. Usually, an employer who is seeking employee referrals will send an email or speak with current “all star” employees and ask them if they know anyone who would be a good fit for an opening. In addition, it is usually a good idea to incentivize your employees. There are a number of incentives you can recommend ranging from simple cash bonuses to stock to vacation days to gifts and more. Get creative and figure out what would motivate your employees to refer their friends. If done well, employee referrals can be a much cheaper and more effective way to find great employees than traditional hiring methods. When you’re hiring for a position, you’ll get a lot more responses, will save money and be better prepared to negotiate if you determine a fair salary range in advance. Fortunately there are many resources on the internet that will allow you to figure out what other companies are paying for a similar position. Two great places to start are Glassdoor and Payscale. Let’s walk through an example. 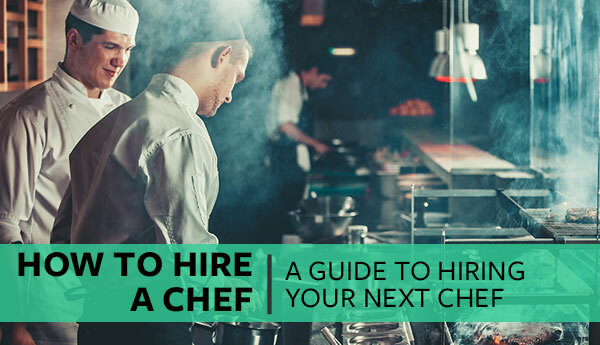 Let’s say you’re hypothetically hiring for a Restaurant Manager position in San Francisco, CA. You’d start by logging onto Glassdoor.com and clicking the salaries button highlighted in the image below. Then, simply enter “Restaurant Manager” and select San Francisco as your city. 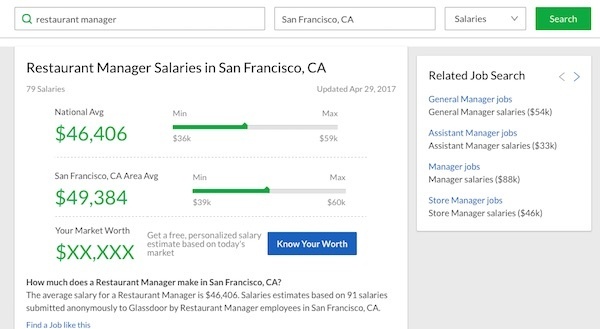 Once you click the green search button, you’ll instantly see the national average for the position as well as the average for your city, in this case, San Francisco. You can also scroll down and see what other companies in your area are paying for the position which will allow you to adjust the average above depending on your specific company. Once you have an idea of what is fair, you can create a rough salary range and include it in your ad. Inevitably in the hiring process you will come to the negotiation of salary and benefits. If you followed step #6 you will already be offering a fair number and will have a well-researched fair salary range in mind. However, you’ll want to avoid being too hard-nosed. You don’t want to start off on the wrong foot with a new employee. Listen to the applicant when they present, they may have some good points about why they deserve to be paid more. We get it, training can take time. Sometimes you just need a new employee to be productive quickly. However, this is usually a bad idea. A lack of training is one of the five most commonly cited reasons why new employees quit. In fact, employees who are put through a structured onboarding program are 58% more likely to still be with a company after three years. A 2012 study found that when new hires were supported during their first 90 days on the job, they worked harder and stuck around longer. So how should you go about training a new employee? The best person to train a new employee is the person they’re replacing, if possible. You’ll want to outline all the tasks that position requires and dedicate time to go over each one. Spend the time to create a structure that makes sense. Training the employee on tasks in sequence will prevent confusion down the line. Also, it is important to allot time after each task or set of tasks for feedback from the new hire. Allow them to be heard and adjust the training correspondingly. 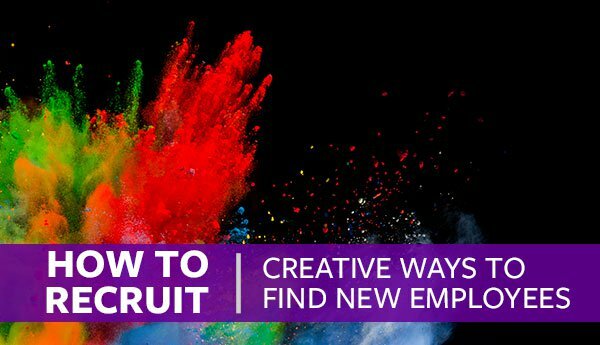 Here is a handy guide to onboarding new employees that should serve as a general overview. If your company has social media accounts like Facebook, Twitter, Linkedin, Pinterest, Instagram, etc. and especially if you have large followings, you should definitely use them to advertise your open positions. 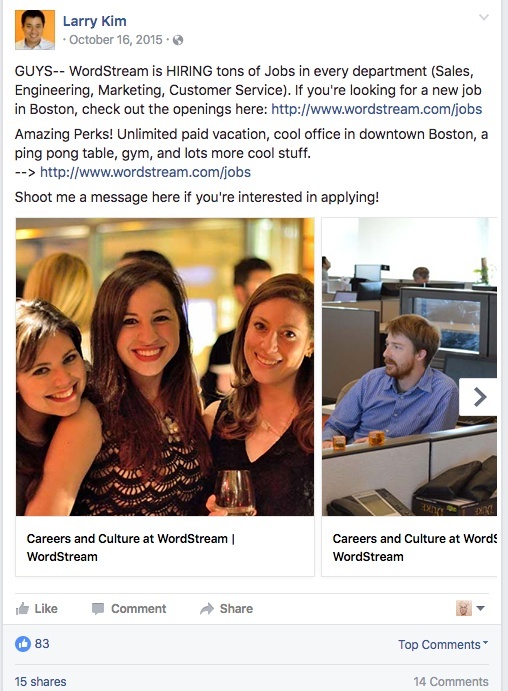 So what does a good social media job ad look like? There are generally two approaches you can take. Many companies opt to just post a professional ad with some information about the position and how to apply. Like any job ad, you’ll also want to sell the position and include information about why a candidate would want the job. This is a perfectly good approach and below is a good example from Larry Kim. Alternatively, if you’re feeling more creative, social media can allow you to create a clever ad that will set you apart from other companies hiring. At the same time, you can have candidates provide a more creative application. This will help you pick the best ones to interview. 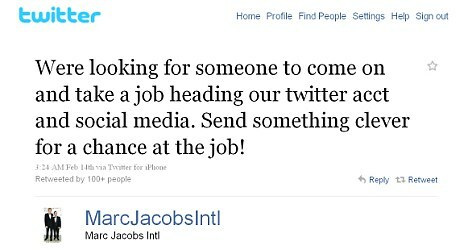 Check out the example below of how a company asked for a creative application for a social media manager job opening. In addition to simply posting your ad, you can also create a paid budget so that you can get reach beyond your company following. Most of the major social media sites offer this option and see the guides below for step by step directions on how to set up a sponsored post on each site! The average worker in the United States works 47 hours per week which means they’re spending A LOT of time in the office each week. 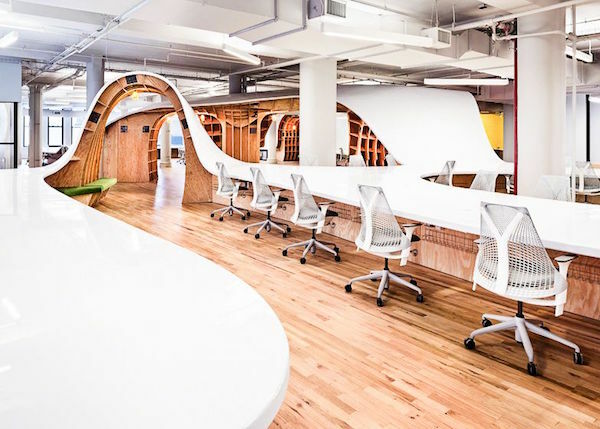 As a result, many candidates decision on what job to accept can be influenced by your office space. Furthermore, research has shown that improving your office space can improve the productivity of your employees. So what can you do to easily improve your workspace to attract candidates, particularly millennials? One easy and often low cost step is to move to a more open office space. Additionally, an easy shift is to loosen up your company’s dress code if you have one. Many millennial workers are giving up the suit and tie in favor of shorts and t-shirts. Finally, add more plants, bean bags, foosball tables, hammocks, etc. 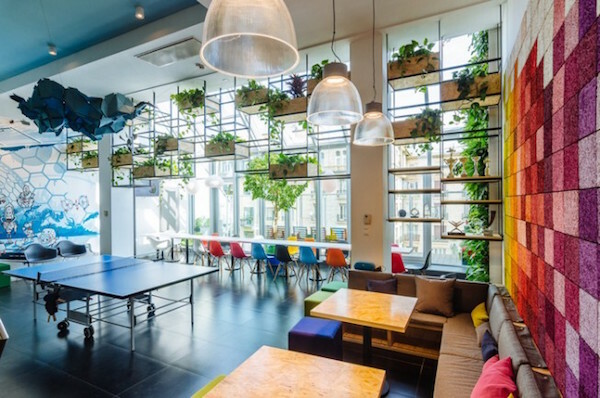 Overall, just aim to make your workplace a fun and engaging place to work. When posting a job ad, it’s tempting to just post an ad on one of the larger job boards out there like Indeed, Monster, Craigslist, Glassdoor etc. and call it good. However, you might be missing out on some more specialized candidates by taking this approach. That’s because nowadays there are hundreds if not thousands of niche job board out there where you can hire for almost any position or industry specifically. For example, want a programmer? Then check out Crunchboard, Stack Overflow Careers, or RubyNow. Check out Talent Zoo or Art Jobs. Looking for someone who can work remotely? Then head over to We Work Remotely. You get the idea. There are job boards for literally every position in any industry. One of the best ways to make a good hire is to learn from your successes in the past. Select three or four of your best employees and take some time to review what has made them so successful. What is it about their personality, work style, background, etc. that makes them good employees? Look for similarities and outline it in a document that you bring to interviews. Having an idea of what makes a good employee at your company will help you to more objectively determine if a candidate is a good fit or not. Interviewing candidates is an art form and can only be developed through practice. If you’re going to be hiring someone, it’s worth spending a couple hours practicing your skills as an interviewer. Fortunately, we put together a guide on how to interview job candidates that will serve as a good starting point. In addition, there are tons of resources on the internet you can find. Simply Google “How to Interview Candidates” and start reading. However, often the best way to learn is to practice on current employees, friends and family. When competing for applicants with other employers, one of the key differentiators is how much money a candidate will earn and what sort of benefits they will receive from their job. If you’re a bit strapped for cash and can’t pay more than other companies, consider getting creative with the benefits you offer potential employees. If you’re clever, you can win a candidate over with benefits that cost your company little to nothing. Get creative and figure out what candidates want. You’ll often find that more qualitative perks like time off will allow you to win over candidates without paying more. Hiring is expensive so you should always be attempting to figure out what works the best. You could test your job title. Create the same posting twice and use a different title, see which gets more applicants. You could test job boards. Create an ad on two separate job boards and see how many applicants you get. Then, use some basic math as shown below to figure out which job board has the lowest cost per applicant or cost per good applicant. 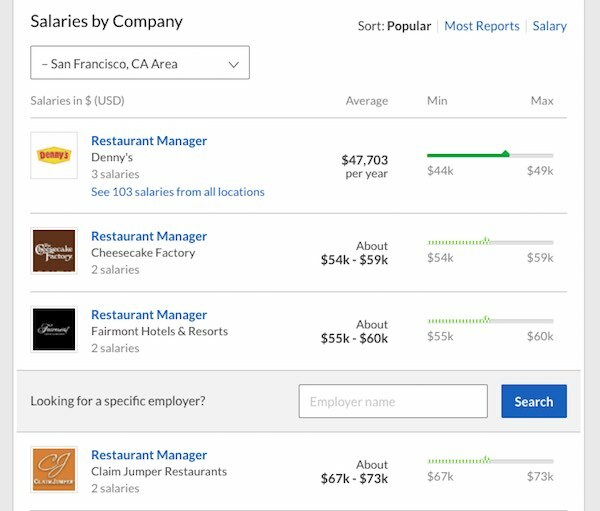 You could test offering different salaries to see if you get more or less applicants. 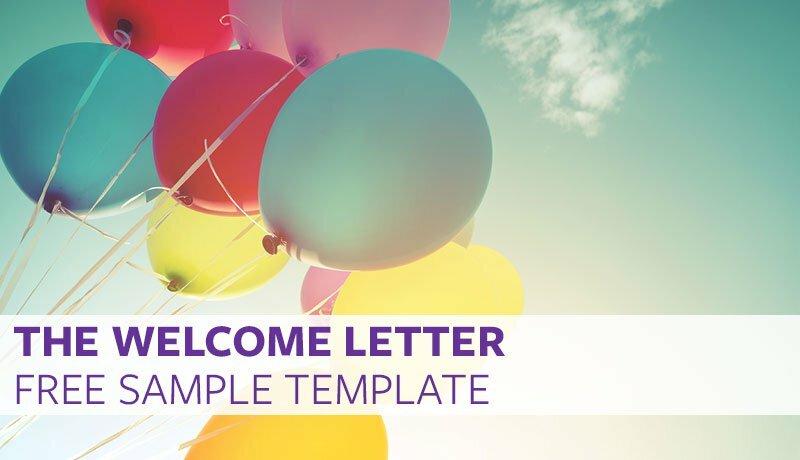 You could test asking for a cover letter vs. not asking for a cover letter to see how many applicants you’ll miss out on. When you’re testing, it’s a good idea to keep some sort of spreadsheet to keep track of your experiments. Today there are what seems like 100s of apps, job boards and hiring services. All of them promise to get you the best applicants and to do so quickly and cheaply. Many of them work really well. However, that doesn’t mean you should forget about the tried and true methods for finding applicants. They often are good supplements to your more modern search process. Furthermore, many of them are free. This means if you can find an employee by posting a help wanted sign in the window of your store, you could potentially save hundreds or thousands of dollars in search costs. If you’re not doing reference checks on prospective employees, you have a huge hole in your hiring process even if it hasn’t had a negative effect yet. Checking references is important for two reasons. First of all, checking references will allow you to double check if what a candidate told you is accurate. Secondly, it will allow you to get a second opinion on a candidate with someone who has actually worked with them. It will help you better understand a prospective employee’s strengths and weekends. Finally, you should be able to deduce if the candidate will be a good cultural fit or not. Checking references shouldn’t be a tremendously time consuming process. Simply call a candidate’s references and focus on confirming information and skills the candidate highlighted in the interview. Then, ask qualitative questions about what the candidate is like at work to assess cultural fit. For more information on how to check references, check out this article. Interviews are great for getting to know a candidate but they don’t really show you what a candidate is like at work. More recently, many employers have embraced the idea of trial projects. Trial projects are sort of like working interviews. Typically, an employer will create a task that the candidate might encounter as an employee and then give them a couple of days or a week to work on it. As a result, many employers have found they get a much clearer picture of what a candidate is like and a better idea of their skillsets, their strengths and their weaknesses. Have you ever considered doing a group interview with an applicant or at the very least getting more than one person to interview an applicant? If not, you might be missing out. Getting an outside opinion on an employee can help prevent the personal bias that naturally occurs when meeting and interviewing new people. Having someone who would work alongside the candidate is also a good idea because they will have a better understanding of the day to day work and what strengths are needed. In addition, you’ll likely find that bringing in a diverse group of employees will help you better understand how the candidate fits, or doesn’t fit, with your company’s culture. Here are some good mini-articles on conducting group interviews. Similarly to marketing for your business, it’s always a good idea to be constantly on the lookout for good prospects or potential employees. Did you meet someone at the local coffee shop who would be a perfect cultural fit and knows about graphic design? Does your neighbor’s friend know everything and anything about coding? Would your friend’s hairdresser make a great customer support representative? Keeping people you meet in daily life in mind will help a lot when you need to hire. You’ll have a few people in mind you can immediately reach out to next time you hire. Because of the more personal connection there is a good chance that one of them will need a job and take you up on it. Furthermore, if you think you’re going to be hiring someone in the next few months and you meet someone who would be a good fit, let them know. Sometimes you’ll have someone ready to take the job as soon as it becomes available. Although the previous twenty recruiting strategies will help you hire more effectively, ultimately the most effective and cheapest option for recruiting is to keep employees from leaving in the first place. The average cost of a bad hire is at least 30% of their first year salary according to the U.S. Department of Labor, which is a lot. Even if you lose an employee and replace them with someone stellar, you’re still spending money you don’t need to be spending. Of course there are legitimate reasons an employee might quit. Focus on avoiding losing employees unnecessarily. Recruiting can be a complicated, time-consuming and expensive process. However, if you pay attention to these twenty recruiting strategies, it should become significantly easier. Have another strategy we forgot or that you think is particularly helpful? Let us know in the comments below, we’d love to hear it! Will is a content marketer for Proven. He is from Boulder, Colorado and when not writing awesome content, he enjoys all things outdoors, including but certainly not limited to skiing, camping, hiking, and surfing.